Eek! This treatment sounds way more technical and scary than it actually is! LED Light Therapy is a great add-on to your customized facial or an easy way to get results with a quick visit to the spa. Even better, it’s painless! The service basically feels like you’re laying out in the sun – but good for you! How good? Our LED light system consists of nearly 3,000 individual red, blue, green, and yellow lights. Our skilled estheticians will customize your LED experience to address your specific needs. 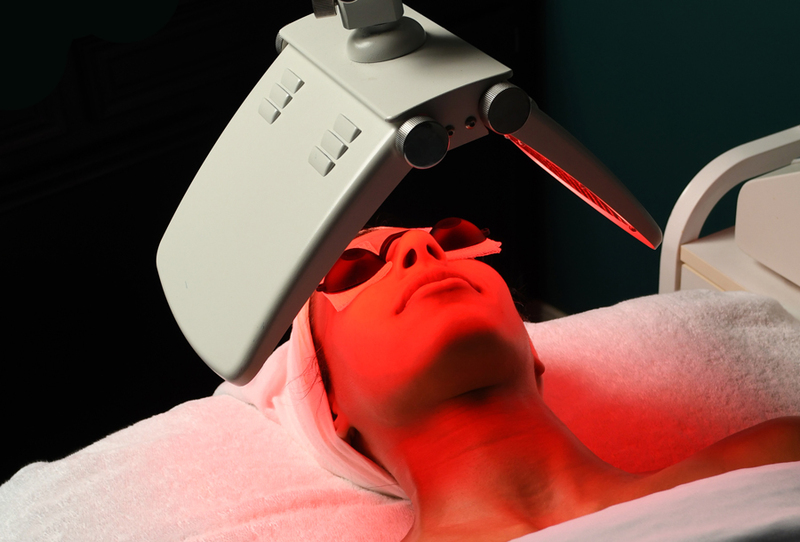 Red light stimulates collagen production while shrinking enlarged pores and tightening skin. Blue light is effective at killing the bacteria that causes acne – say goodbye to blackheads and whiteheads! Green light reduces redness and fading, in case you have any pigmentation concerns. Yellow light tones and firms loose skin, making it amazing for correcting any loss of elasticity and volume. In under 30 minutes, you’ll be well on your way to glowing, radiant skin. Plus, there is no downtime – you can come in for the service and go right back to work, running errands, or carpool! And the cherry on top? The benefits of the service build upon each other. Ideally, you would set aside time on your calendar for a series of treatments – one every other week over the course of 3 months. You’ll see maximum results in a short time, while pocketing the savings for signing up for a package instead of individual treatments. Even one treatment per year, however, can help deliver big results, as long as it’s coupled with a healthy and consistent skin care regimen. One final benefit: an appointment for the LED Light Therapy service in the winter can help counteract seasonal affective disorder (SAD). We’ll take all the mood boosters we can get! Skin peels can produce a number of great results, including reduced wrinkles and fine lines, improved texture and tone of skin, along with clearing of blemishes. Chemical peels can also diminish the visibility of scars as well as enhance hydration! Sanctuary Spa uses products from Source Vital Apothecary, a natural-based skin care line, and Rhonda Allison, a science-based, natural-inspired skin care line. With these two lines, our knowledgeable estheticians can partner with you to create the right peel for your skin care needs. They will apply an acid-and-enzyme solution completely customized for you, ranging from a concentrated blend of pure essential oils like Lemon, Rose Absolute, and Lavender to an Apple Wine Peel (cheers!) or Hibiscus Flower Acid. I know what you’re thinking. “Does this mean I have to hibernate in a cave for 10 days while my skin falls off?? No! While everyone’s skin reacts differently (and we do see a range of actual skin peeling), most people only experience a moderate amount of peeling and are easily able to go back to their normal routine the next day. Your esthetician will walk you through your home care once you finish your peel. You really should minimize sun exposure following a peel, so please wear sunscreen, and take advantage of the limited sun light hours during the winter by scheduling your chemical peel today. We have healing balms and soothing topical balms to reduce any appearance of an inflammation. Even better, because the chemical peel has removed the first layer of skin, the products you use on your skin will be absorbed more effectively! To maximize the benefits of a chemical peel, we recommend a series of treatments, with your second visit scheduled 4 to 6 weeks after your first. Now, we hear you asking, “But what about the rest of my body?” The funny thing about being swimwear-ready by May (who are we kidding, by April for us Houstonians) is that you can’t just start in March and hope everything will be OK. True preparation begins during winter by drinking plenty of water daily, following a healthy diet (understanding holidays don’t count, of course! ), and then adding the following must-have service to improve the appearance and smoothness of your skin. The G5 Massage is deep tissue massage performed by a special machine that produces vertical and horizontal strokes at the same time. The machine applies pressure from both directions, making it very effective at detoxifying the body and stimulating lymphatic drainage. In addition, the G5 massage improves circulation and breaks up fat deposits, reducing the appearance of cellulite. We then take our G5 massage service to the next level with our custom blend of massage and essential oils. This precise blend of essential oils helps relieve any inflammation, while further toning and hydrating your skin. The particular essential oils used also stimulates sweating, which improves circulation and aides with detoxification. The aromatherapy benefits are also in full effect, decreasing your cortisol levels. Bonus! These amazing results are accompanied by the traditional relaxation benefits you expect from a high-quality Sanctuary Spa massage. While you should notice improved skin texture pretty immediately, the benefit of starting with the G5 massage in winter is that you should be able to complete 3 treatments before Houston starts to feel the heat of summer. The service can be completed in 45 minutes, so it’s optimal for getting in and out while the kids are in school or you are on a lunch break. Do you have more time? Enhance your G5 massage experience with either of these two excellent treatments! The Stress Relief Backpack is a 20-minute additional service that will aid the detoxification results started by the massage. The Sea Salt Scrub provides complete exfoliation of your body, ridding it of dead skin cells and improving skin texture, a perfect complement. So, while we all enjoy breaking out our boots and snuggly sweaters, we should also remember the importance of self-care for our skin during the winter months. With all of the shopping, eating, and travel that occurs during the holidays, Sanctuary Spa offers a convenient retreat whether you have a little over an hour or more than three hours. As with every skin care routine, consistency is key. By incorporating any (or all!) of these 3 treatments into your routine this winter, you’ll have the radiant skin of your dreams come summer. Set up your next visit online at besanctuary.com/book or call 713- 6222-7722 to speak with our friendly guest care team.